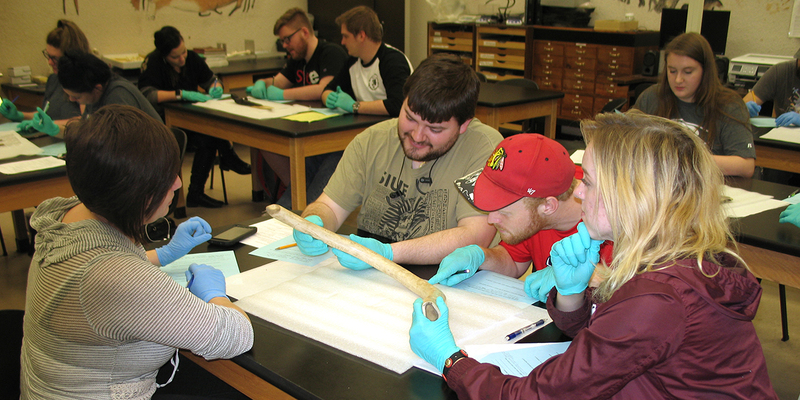 Undergraduate students at SIUE can major in anthropology, choosing either the BA or BS. The BA requires two semesters of a foreign language, while the BS requires the student to complete one of our field schools. Students can also minor in anthropology at SIUE by taking one of the introductory classes (ANTH 111A or ANTH 111B), plus five more anthropology electives. Graduate students at SIUE can study anthropology by pursuing an MA or MS in Integrative Studies, focusing on Cultural Heritage and Resources Management. Students can prepare for a museum career by taking courses in anthropology and history, or they can prepare for a career in cultural resource management by taking courses in anthropology and geography. The SIUE Department of Anthropology also administers two interdisciplinary minors for undergraduates. The minor in Native American studies consists of courses in anthropology, history and philosophy. The minor in forensic sciences requires courses in anthropology, biology, chemistry and criminal justice. The interdisciplinary minor in Native American studies permits students to study Native Americans from a variety of scholarly and native perspectives. The understanding of Native Americans, past and present, has been hindered by alternating efforts to dehumanize and vilify them as "ignoble savages;" vs. tendencies to stereotype and exalt them as "noble savages;" vs. simply ignoring their role in history and contemporary society. The Native American studies minor raises awareness of central issues for Native Americans by critically examining their past, present and future through diverse bodies of evidence such as material culture, oral histories, ethnohistory and ethnography. If you want to deepen your understanding of the roles and perspectives of America's first peoples, past and present, then a minor in Native American studies is for you. For more information, please contact Dr. Julie Zimmermann of the Anthropology Department. The forensic sciences minor is interdisciplinary, exposing students to concepts and skills of social and natural science disciplines that relate to legal matters. The minor is ideal as a supplement to major programs focused on forensic applications or majors that incorporate forensic-related material, and for students considering careers in forensic analysis, law enforcement or other areas of the criminal justice and legal systems. Students completing the minor in Forensic Sciences at SIUE will take courses in anthropology, biological sciences, chemistry and criminal justice. If you have any questions, please contact Dr. Corey Ragsdale of the Anthropology Department.